The first time it happened was in 1910, near Cleveland, Tennessee. 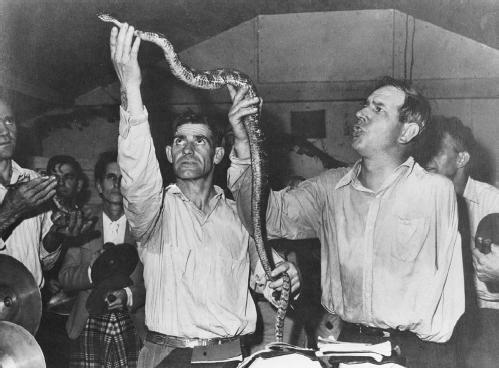 George Hensley, a 30 year old, self-taught Pentecostal preacher, took a rattlesnake from a box at the end of his sermon, and told the men in the room to “Handle it, or face the fires of hell” as an outward and visible demonstration of their faith, and as a sign to others that their faith was true. He went on to preach this same kind of message for 45 years, starting several churches in the Tennessee-Kentucky area, loosely affiliated under the name “Church of God with Signs Following.” Hensley died in 1955. There are still scattered snake-handling, cyanide-drinking, fire-touching churches that get together in the backwoods of Appalachia. They’re hard to find because most states have outlawed their practices; Tennessee did so in the mid-40s after three people had died in the process of proving their faith. But it goes on, still. Just last November, an elderly woman in Georgia succumbed to the venom of several rattlesnake bites. So what in the name of Jesus, or that picture on the wall titled “Jesus”, is going on here? It’s religion. It’s the acting out of faith in superficial (but deadly) ways, rather than the acting in faith that Jesus taught and demonstrated. It is always easier to go through the motions of Christianity than it is to follow Jesus. The motions of Christianity are always done within a friendly gathering with other, like-minded members, according to ritual, tradition, and approved liturgies. 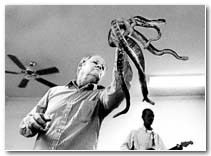 The snake-handlers, of course, take those rituals to an extreme which causes their average age to be somewhat less (I’m guessing) than the average Presbyterian congregation’s median age. But it is still a hollow, religious, self-affirming and ultimately pointless set of motions in which they are participating. Handling snakes has no more to do with following Jesus than the lighting of brass and glass “candles” in church, or the installation of a kabillion dollar pipe organ. The superficialities of Christianity are often beautiful, sometimes exciting, and pleasantly reassuring, but have little to do with following Jesus. They make us feel like we are doing something for the Kingdom of God, when it’s usually for the benefit of others in our subset of religionists that we are really doing them. (We love the applause!) The superficialities of Christianity make us feel good but always at the expense of someone else’s ignored and continuing misery. Jesus was about the alleviation of suffering, and the direct and unencumbered relationship between humans and God, and humans with each other. He taught that, demonstrated that, and died for that. Everything else is fluff- decorations hung on the cross in an attempt to disguise its severity and its revolutionary thrust into the affairs of humankind. And, besides that, the snake handlers have chosen a tiny piece of scripture as their gathering point, that virtually no serious student of the scripture believes was written by Mark. I’ll talk about that later. Meantime, look in your Bibles, and you’ll see that scripture just kind of hanging there, out of tradition, and not much else. ← Just Because…it’s inspiring. Amateur Paul Potts sings opera..
Erhman in Misquoting Jesus says flat out that the verses (Mark 16:17-18) are not original to Matthew. He’s a smart guy, I’ll take his word for it. On to the more important points, we didn’t have printing presses back then. Judaism, Christianity and Islam are all using the products of scribes. Scribes made mistakes and scribes deliberately altered texts. “Rulebook” believers are interesting to me because the rulebook is only as good as a man can make. Scholars tell us the texts all have errors. Some texts are more accurate and some texts are less accurate, but no texts are perfect. So in my view from afar, folks could lighten up a bit on the quoting. Stick to the big stuff, the major concepts. The most religious layperson I have ever met was a Muslim named Zach. It would never have occurred to Zach to apply Islam to someone else. Zach judged himself, no one else. He spent every day trying to live his life as his God would have wanted him to live it. Snake handlers are crazy, crazy people. 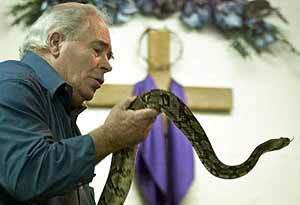 Last I checked you don’t get saved by getting bit by a snake. It’s through the blood of Jesus Christ.